SLC/CCL21, normally expressed in high endothelial venules and in T cell zones of spleen and lymph nodes, strongly attracts T cells and dendritic cells (DC). We have previously shown that SLC/CCL21-mediated anti-tumor responses are accompanied by significant induction of IFNγ and the CXC chemokines, monokine induced by IFNγ (MIG/CXCL9) and IFNγ-inducible protein-10 (IP-10/CXCL10). We assessed the importance of IFNγ, IP-10/CXCL10 and MIG/CXCL9 in SLC/CCL21 therapy. In vivo depletion of IP-10/CXCL10, MIG/CXCL9 or IFNγ significantly reduced the anti-tumor efficacy of SLC/CCL21. Assessment of cytokine production at the tumor site showed an interdependence of IFNγ, MIG/CXCL9 and IP-10/CXCL10; neutralization of any one of these cytokines caused a concomitant decrease in all three cytokines. Similarly, neutralization of any one of these cytokines led to a decrease in the frequency of CXCR3+ve T cells and CD11c+ve DC at the tumor site. These findings indicate that the full potency of SLC/CCL21-mediated anti-tumor responses require in part the induction of IFNγ, MIG/CXCL9 and IP-10/CXCL10. SLC/CCL21, normally expressed in high endothelial venules and in T cell zones of spleen and lymph nodes, strongly attracts T cells and dendritic cells (DC) [1–8]. SLC/CCL21 recruits both naïve lymphocytes and antigen stimulated DC into T cell zones of secondary lymphoid organs, co-localizing these early immune response constituents that culminate in cognate T cell activation . The capacity to facilitate the co-localization of both DC and T cells forms a strong rationale for the use of SLC/CCL21 in cancer therapy. In previous studies we have shown that the SLC/CCL21-mediated anti-tumor responses are accompanied by the enhanced elaboration of IFNγ, IP-10/CXCL10, MIG/CXCL9, GM-CSF and IL-12, but decreased PGE2, VEGF, IL-10, and TGF-β at the tumor site [9, 10]. In addition, there was a marked increase in CD4+ and CD8+ cells secreting IFNγ and GM-CSF as well as DC expressing CD11c infiltrating the tumors. MIG/CXCL 9 and IP-10/CXCL10 are glutamine-leucine-arginine (ELR)-negative CXC chemokines that are potent chemoattractants for activated T cells [11–13]. These chemokines also have in common the ability to signal through a G protein-coupled receptor, CXCR3, expressed on activated T lymphocytes. IP-10/CXCL10, MIG/CXCL9 and IFNγ are known to have potent anti-tumor activities in vivo [14–17]. Both MIG/CXCL9 and IP-10/CXCL10 are important for the anti-tumor activity mediated by IFNγ inducing cytokines such as IL-12 [16, 18, 19]. Based on these findings we hypothesized that augmentation in IFNγ, MIG/CXCL9, and IP-10/CXCL10 would play an important role in the SLC/CCL21-mediated anti-tumor response. Here we show that the cytokines IFNγ, IP-10/CXCL10 and MIG/CXCL9 serve as effector molecules in SLC/CCL21-mediated anti-tumor responses. Host antigen presenting cells (APC) are critical for the cross-presentation of tumor antigens . However tumors have the capacity to limit APC maturation, function and infiltration of the tumor site [21–24]. Thus molecules that attract host APC and T cells could serve as potent agents for cancer immunotherapy. A potentially effective pathway to restore Ag presentation is the establishment of a chemotactic gradient that favors localization of both activated DC and Type 1 cytokine producing lymphocytes at the tumor site. SLC/CCL21, a CC chemokine expressed in high endothelial venules and in T cell zones of spleen and lymph nodes, strongly attracts naive T cells and DCs [1–8]. Because DCs are potent APCs that function as principal activators of T cells, the capacity to facilitate the co-localization of both DC and T cells may reverse tumor-mediated immune suppression and orchestrate effective cell-mediated immune responses [9, 10, 25–27]. In addition to its immunotherapeutic potential, SLC/CCL21 has been found to have potent angiostatic effects , thus adding further support for its use in cancer therapy. Based on these dual capacities, we as well as others have begun pre-clinical evaluation of SLC/CCL21 in several tumor models [9, 10, 25–27]. Utilizing two transplantable murine lung cancer models, we have previously shown that the anti-tumor efficacy of SLC/CCL21 is T cell-dependent . In both models recombinant SLC/CCL21 administered intratumorally led to complete tumor eradication in 40 % of the treated mice. Studies performed in CD4 and CD8 knockout mice also revealed a requirement for both CD4 and CD8 lymphocytes subsets for SLC/CCL21 mediated tumor regression. Consistent with these findings we found that SLC therapy did not alter tumor growth in SCID mice. In immune competent mice, intratumoral injection of SLC/CCL21 led to a significant increase in CD4 and CD8 T lymphocytes as well as DC infiltrating the tumor and the draining lymph nodes. The cellular infiltrates were accompanied by an enhanced elaboration of IL-12, IFNγ, IP-10/CXCL10 and MIG/CXCL9 at the tumor site . SLC/CCL21 is documented to have direct anti-angiogenic effects [28, 29]; the tumor reductions observed in this model could have been due to participation by T cells secreting IFNγ leading to inhibition of angiogenesis via MIG/CXCL9 and IP-10/CXCL10, as well as T cell-dependent immunity . IFNγ mediates a range of biological effects that facilitate anticancer immunity. MIG/CXCL9 and IP-10/CXCL10 are potent angiostatic factors that are induced by IFNγ [14, 16, 17]. Both MIG/CXCL9 and IP-10/CXCL10 are chemotactic for stimulated CXCR3-expressing activated T lymphocytes that could further amplify IFNγ at the tumor site . Hence we postulated that in addition to IFNγ, IP-10/CXCL10 and MIG/CXCL9 would also be important contributors to the tumor reduction in the context of SLC/CCL21 therapy. To determine the importance of MIG/CXCL9, IP-10/CXCL10 and IFNγ in the SLC/CCL21 mediated antitumor response, these cytokines were depleted in SLC/CCL21-treated mice. 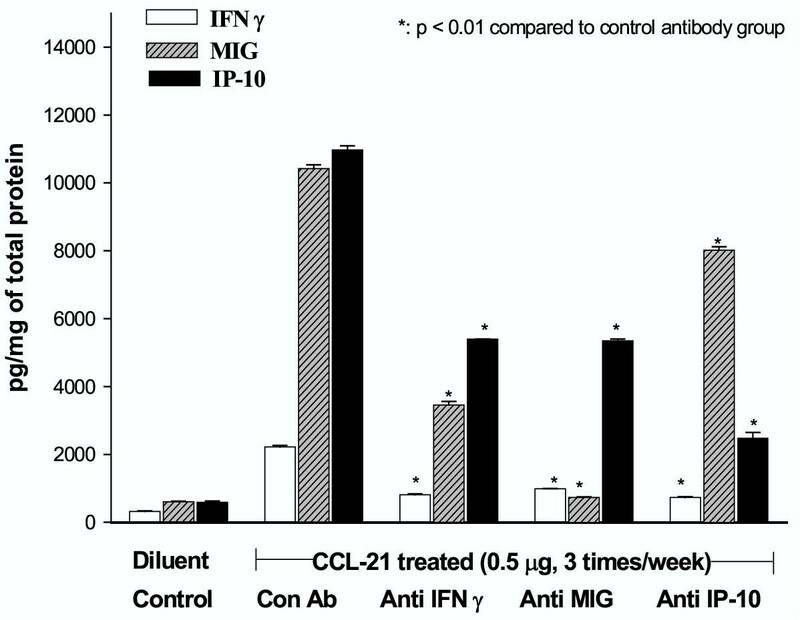 Anti-IP-10/CXCL10, MIG/CXCL9 and IFNγ antibodies each partially but yet significantly inhibited the anti-tumor efficacy of SLC/CCL21 (Figure 1 * p < 0.01 compared to the control antibody group). Neutralization of IFNγ caused a significant decrease in both MIG/CXCL9 and IP-10/CXCL10 indicating that these chemokines are largely IFNγ dependent. Thus, an increase in IFNγ at the tumor site of SLC/CCL21-treated mice could explain the relative increases in IP-10/CXCL10 and MIG/CXCL9. The converse was also observed; IFNγ production at the tumor site was found to be MIG/CXCL9- and IP-10/CXCL10-dependent as indicated by the fact that neutralization of these cytokines caused a significant decrease in IFNγ(Figure 2). Neutralization of any one of these cytokines caused a concomitant decrease in all three cytokines, thus indicating that IFNγ, MIG/CXCL9 and IP-10/CXCL10 are interdependent in the SLC/CCL21-mediated anti-tumor responses. Based on these findings, we speculated that the decrease of IP-10/CXCL10 and MIG/CXCL9 led to a decrease in IFNγ by limiting the influx of T cells producing IFNγ at the tumor site. Because MIG/CXCL9 and IP-10/CXCL10 are chemotactic for stimulated CXCR3 expressing activated T lymphocytes, we determined if neutralizing these chemokines in vivo in the SLC/CCL21-treated mice would decrease the frequency of CXCR3 expressing T cells at the tumor sites. Compared to SLC/CCL21-treated mice receiving control antibody, flow cytometric evaluation of single-cell suspensions of non-necrotic tumors from SLC/CCL21-treated mice receiving neutralizing antibodies to MIG/CXCL9, IP-10/CXCL10 and IFNγ showed 10, 12 and 31 % decreases, respectively, in the gated CD3 CXCR3+ve T cell populations (Table 1). The fact that neutralization of IFNγ was the most efficient at decreasing the total number of CXCR3-activated T cells may be due to the decrease in the IFNγ-dependent CXCR3 ligands MIG/CXCL9 and IP-10/CXCL10. Individually, neutralizing MIG/CXCL9 and/or IP-10/CXCL10 only led to a partial decrease in the total number of CXCR3-activated T cells. Because MIG/CXCL9 and IP-10/CXCL10 share the same receptor (CXCR3), one possible explanation of a partial decrease in CXCR3-activated T cells is that neutralization of one ligand may overexpose the receptor to the other ligand. Furthermore, because murine SLC/CCL21 binds CXCR3 receptor, SLC/CCL21 may be recruiting CXCR3+ve T cells directly. An alternative explanation is that residual cytokines such as IFN-inducible T cell α chemoattractant (ITAC/CXCL11) present after in vivo neutralization of IFNγ, MIG, IP-10 may have remaining activity and attract CXCR3+ve T cells. Our results imply that all 3 cytokines, IFNγ, MIG and IP-10 play interrelated roles in the recruitment of CXCR3-activated T cells in SLC/CCL21-mediated anti-tumor responses. While the number of CD4 and CD8 cells remained unaltered, compared to SLC/CCL21-treated mice receiving control antibody, mice administered neutralizing antibodies to MIG/CXCL9, IP-10/CXCL10 and IFNγ showed respective decreases of 38, 28 and 16% in the number of CD11c+ DEC205+ DC infiltrating the tumor (Table 1). At present it is not clear why there is a decrease in DC following neutralization of MIG/CXCL9, IP-10/CXCL10 and IFNγ. A plausible explanation is that these cytokines may be involved in complex interactions with other molecules that are chemotactic for DC. Further studies are required to delineate the mechanisms responsible for MIG/CXCL9, IP-10/CXCL10 and IFNγ mediated localization of DC at the tumor site. Single cell suspensions of non-necrotic tumor nodules from SLC/CCL21 treated mice receiving neutralizing antibodies to P-10/CXCL10, MIG/CXCL9, IFNγ, control Ab and diluent treated tumor bearing mice were prepared. Cell surface staining for T cell markers CD4, CD8, CD3, and the chemokine receptor CXCR3 as well as DC markers CD11C and DEC205 were evaluated by flow cytometry. Cells were identified as lymphocytes or DC by gating on the forward and side scatter profiles; 10,000 gated events were collected and analyzed using Cell Quest software. Within the gated T lymphocyte population, intratumoral injection of SLC/CCL21 led to an increase in the frequency of CD4+, CD8+, CD3+CXCR3+ events compared to the diluent control (*p < 0.001). Within the gated DC population, intratumoral injection of SLC/CCL21 led to an increase in the frequency of CD11C+DEC205+ events compared to the diluent control (*p < 0.001). 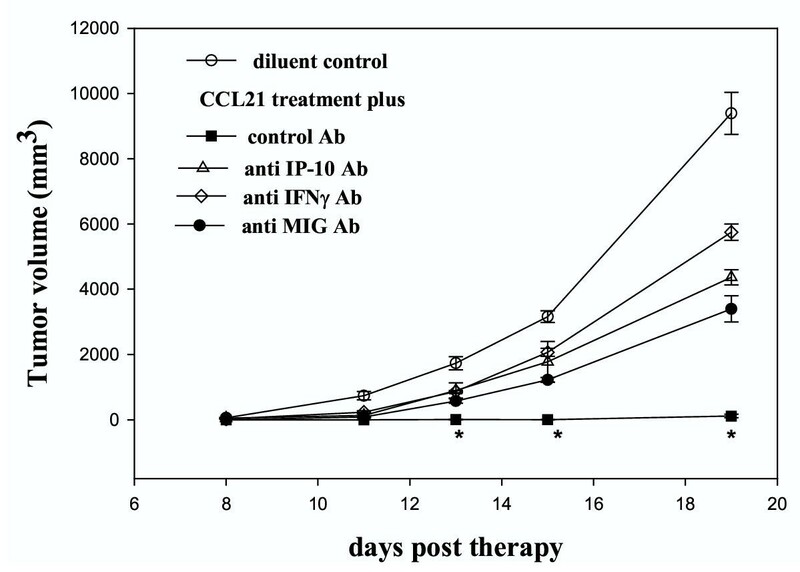 Compared to SLC/CCL21-treated mice receiving control antibody, mice receiving neutralizing antibodies to IP-10/CXCL10, MIG/CXCL9, and IFNγ showed decrease in the gated CD3+CXCR3+ T cell as well as CD11C+DEC205 + DC events (**p < 0.01) (n = 8 mice per group). MCF is mean channel fluorescence intensity. CD3+CXCR3+ MCF is for CXCR3. CD11C+DEC205+, MCF is for DEC205. Our results suggest that the anti-tumor properties of SLC/CCL21 may be due to its chemotactic capacity in co-localization of DC and T cells as well as in part to the induction of key cytokines such as IFNγ, IP-10/CXCL10 and MIG/CXCL9. Abs to murine IFNγ, recombinant IFNγ were obtained from PharMingen (San Diego, CA). Abs to murine MIG/CXCL9, IP-10/CXCL10 and recombinant cytokine standards was purchased from R&D (Minneapolis, MN). Recombinant SLC/CCL21 was obtained from PeproTech. (Rocky Hill, NJ). Polyclonal goat anti-murine MIG/CXCL9 and anti-murine IP-10/CXCL10 specific anti-serum were produced and characterized as previously described . Anti-mouse IFNγ monoclonal (R4-462, American Type Culture Collection, Rockville, Maryland, MD) neutralizing antibody was purified by affinity chromatography from SCID mice ascites, which was generated 3–4 weeks after intraperitoneal injection of 106 R4-462 hybridoma cells per mouse . For flow cytometry, labeled antibodies (FITC, PE, PerCP) against the T cell surface markers to CD3, CD4, CD8 and against the DC markers, CD11c and DEC 205 and the appropriate controls were purchased from PharMingen. FITC labeled anti-rabbit IgG was purchased from PharMingen. Rabbit anti-mouse CXCR3 antibody was purchased from Zymed Laboratories Inc. (So. San Francisco, CA). Murine serum albumin (Sigma, St. Louis, MO) was utilized as control injections for SLC/CCL21. A weakly immunogenic lung cancer, Lewis lung carcinoma (3LL, H-2b) obtained from ATCC (CRL-1642, LLC) was utilized for assessment of cytokines important for SLC/CCL21 – mediated anti-tumor responses in vivo. The cells were routinely cultured as monolayers in 25 cm3 tissue culture flasks containing RPMI 1640 medium (Irvine Scientific, Santa Anna, CA) supplemented with 10% fetal bovine serum (FBS) (Gemini Bioproducts, Calabasas, CA), penicillin (100 U/ml), streptomycin (0.1 mg/ml), 2 mM glutamine (JRH Biosciences, Lenexa, KS) and maintained at 37°C in a humidified atmosphere containing 5% CO2 in air. The cell lines were mycoplasma free and cells were utilized up to the tenth passage before thawing frozen stock cells from liquid N2. For tumorigenesis experiments, 105 3LL tumor cells were inoculated by s.c. injection in the right supra scapular area of C57Bl/6 mice and tumor volumes were monitored three times each week. Five day established tumors were treated with intratumoral injection of 0.5 μg of recombinant murine SLC/CCL21 (Pepro Tech, Rocky Hill, NJ) or murine serum albumin (utilized as an irrelevant protein for control injections) were administered three times per week for two weeks as previously described . 24 h prior to SLC/CCL21 treatment, and then three times a week, mice were injected i.p. with 1 ml/dose of anti-IP-10/CXCL10, or anti-MIG/CXCL9, or 100 μg/dose of purified monoclonal anti-IFNγ or appropriate control antibodies (goat IgG and rat IgG) at equivalent doses for the duration of the experiment. In response to these antibodies, there was a significant reduction of the respective cytokines in vivo (Figure 2). Tumor volume was calculated as previously described . MIG/CXCL9, IP-10/CXCL10 and IFNγ were quantified using a modification of a double ligand method as previously described . Flow cytometric analyses for T cell and DC markers were performed on a FACScan flow cytometer (Becton Dickinson, San Jose, CA) in the University of California, Los Angeles, Jonsson Cancer Center Flow Cytometry Core Facility. Cells were identified as lymphocytes or DC by gating based on forward and side scatter profiles. CD11c+ve DCs were defined as the bright populations within tumor nodules. 10,000-gated events were collected and analyzed using Cell Quest software (Becton Dickinson). For staining, two or three fluorochromes (PE, FITC, PerCP) (PharMingen) were used to gate on the CD3, CD4 and CD8 T lymphocyte population or CD11c +ve DC in single cell suspensions from tumor nodule. For CXCR3 expression, T cells were doubly stained for CD3 and CXCR3 cell surface markers. Groups of 8 mice were used. Statistical analyses of the data in figures 1, 2 and in table 1 were performed using the paired Student t test. Author 1 SS and Author 2 SCY coordinated and carried out all the experiments. Authors SH, LXZ, MH, RKB and MDB contributed to the discussion of the article. Author JFL together with SS performed the statistical analyses. Authors RMS and SMD together with SS conceived of the study, participated in its design and drafted the manuscript. We thank Kimberly Atianzar for excellent technical assistance in conducting the ELISA measurements. National Institutes of Health Grant R01 CA78654, CA85686, P50 CA90388, Medical Research Funds from the Department of Veterans Affairs, The Research Enhancement Award Program in Cancer Gene Medicine and the Tobacco-Related Disease Research Program of the University of California supported this work.